The Kunene River at the far north of Namibia and the northern boundary of the hunting area. Black face impala at a natural fountain, or spring, in the Kunene River Conservancy. 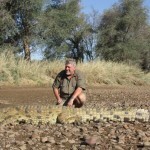 The open water of the Kunene River means croc. This is probably the first free roaming blackface impala taken in around 48 years. 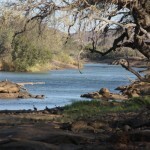 The Kunene River in the afternoon. The area is so remote only a few safaris happen here each year. 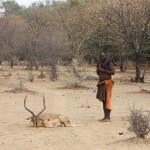 In the Kunene Conservancy, local traditional Himba people work as trackers for the hunts. Click on any photo to see it on a separate page, then click that image for the largest view. My most exclusive hunting area is the Kunene Conservancy far in the north of Namibia. Only a few safari hunters each year set foot on this place. 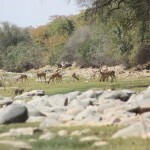 The Kunene Conservancy is one of the only places that free roaming black impala can be hunted. It is an area of 2700 square km that is covered by Mopani bush, big mountains like the Zebra Mountain, and fountains or springs providing fresh water. 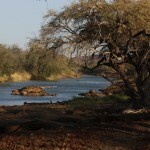 The Conservancy has its most northern border against Angola where the Kunene River forms the Namibia/Angola border. Here is also a stronghold of really big crocodiles that can be hunted. Accommodations in this Conservancy are in a lodge. 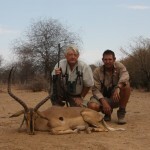 If you are scheduling a safari in another of our areas, you can add hunting in this area to it. Because this is an exclusive area hunted by only a few hunters per year, please contact me for any more information about the area and hunts in the area. Hunts in the Kunene are 5 to 14 days. For leopard, allow a minimum of 10 days. For crocodile, allow a minimum of 7 days.